The Cathedral of Our Lady, Onze-Lieve-Vrouwekathedraal in Dutch, is a striking landmark in Antwerp’s city centre. This Roman Catholic Gothic cathedral is on the UNESCO World Heritage sites list for Belgium. I hope my Forgotten Postcard treatment serves it well. If you would like to learn more about the Forgotten Postcards please see the overview. If you are interested in purchasing this or any of the other Forgotten Postcards visit the Forgotten Postcards Gallery. 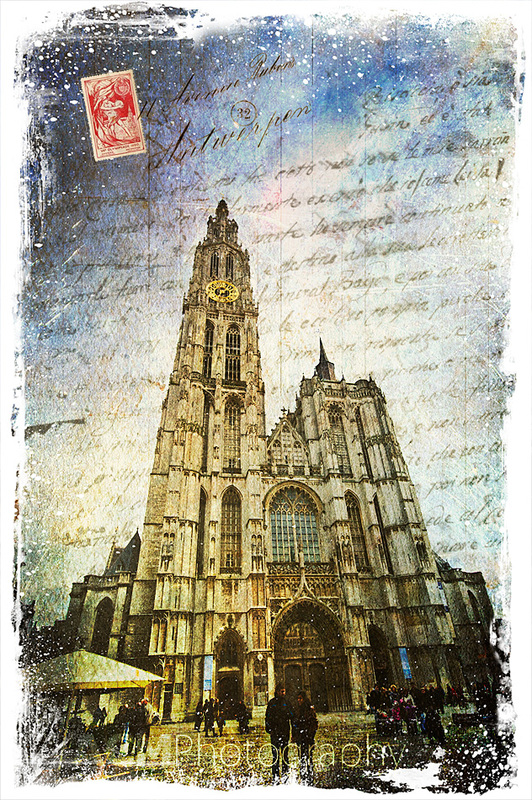 This entry was posted on Friday, February 18th, 2011 at 11:36 and is filed under Belgium, Digital Art, Forgotten Postcards and tagged with Antwerp, Belgium, cathedral, Cathedral of Our Lady, church, digital art, Forgotten Postcard, landmark, photography, postcard, vintage. You can follow any responses to this entry through the RSS 2.0 feed.